The Honda Civic Type R FK2. We had t0 wait a long time on a successor from the famous Honda Civic Type R. Honda decided in October 2010 to stop the production for the European market of the previous Type R, the FN2, because the strict emission standards that were coming. After this it was waiting until September 2012 before the first rumors turned up for the next generation Honda Civic Type R but unfortunately it remained with rumors. March 2014, the Geneva Motor Show. 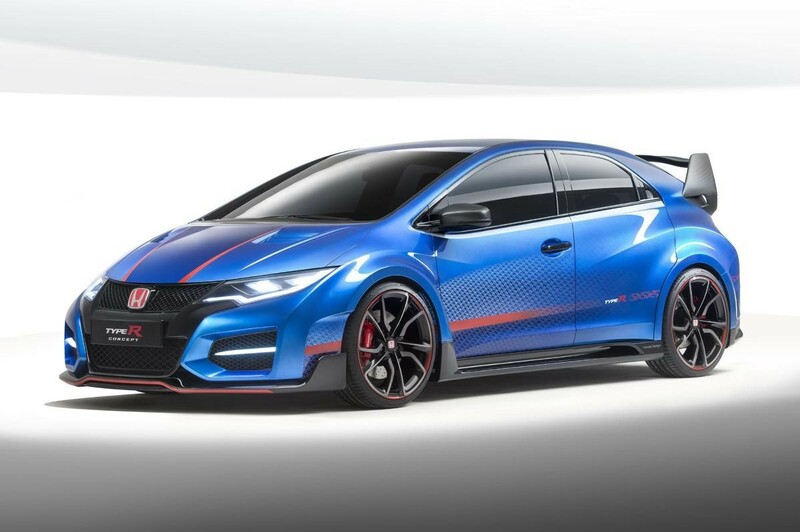 A big day for the many Type R enthusiasts because it was here that the prototype of the newest Honda Civic Type R equipped with a 2 liter turbo engine was presented. A brand new 2.0 liter VTEC TURBO petrol engine, code name K20C1 with direct injection and turbocharger, delivering unrivaled power, torque and performance. The peak power is a sloppy 310 hp @ 6,500 rpm with a maximum torque of 400 Nm that is already released @ 2,500 rpm. 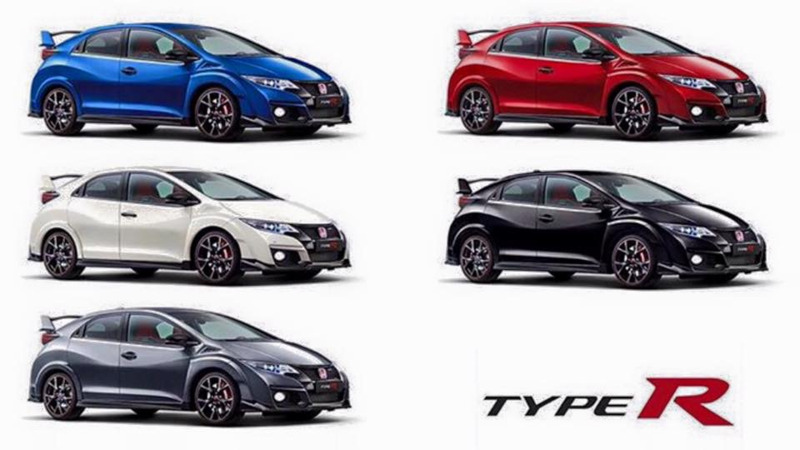 All figures that are higher than all previous Type R models from Honda. The performance of this engine may also be there! To sprint from 0 to 100 km/h, only 5.7 seconds are needed and the top speed with 270 km/h @ 6500 rpm is not bad either. With these sporty looks and nice figures many mouths fell open and we could only hope that this car would really come into production. Then it was again waiting until January 2015 when Honda announced that the 4th generation production ready Honda Civic Type R would make its debut on March 2015 at the 85th Geneva Motor Show. This car was immediately received positively by the world press and others. She is called the race car for the road and has already pulverized the lap record a few times in her class @ the Nürburgring. A sports car pur sang that gets many admiring looks on the road from the public. Also the fact that the FK2 is the shortest build Type R in history witch makes this beauty very rare to spot in the wild. And if you have the luck to spot one, look carefully at the drivers face. Then you will see that the driver is very happy and enjoying driving one of the few Type R FK2 that drives around on this globe. Myself had to wait until mid-September 2015 to meet the car real live at my current dealer Honda Theys in Lier, Belgium. A car on which I fell in love from the first minute I saw her because of the sporty looks that it radiated with its widened mudguards, his stunning trunk spoiler behind, 19 inch rims and many other options that this car was rich. A very complete car for a very fair price if you ask me. On 3 October 2015 I signed the order form at my dealer and 5 months later, on 12 March 2016, the big day was there. I pick up and collect my own Honda Civic Type R GT in the color Milano Red with a few more OEM options. 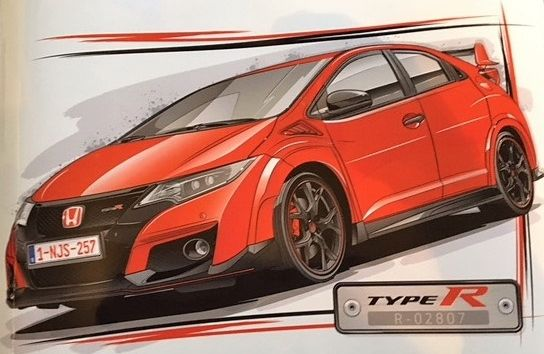 This fourth generation Type R would be built in limited quantity and as the Type R tradition it requires each car would get its individual and unique R-number. Because of this I decided to launch a big search to find as many R-numbers as possible witch are distributed throughout the world. A impossible task? Maybe! Meanwhile, on 27 September 2018, I'm busy with my search through my FB group Honda CTR-FK2. The big search for two years already and I have found with the help from some members already a lot FK2 Type R's witch are listed. This list will be posted here on this website every day in an updated version so everyone can see where these R's with associated information are located in the world. Between 2015 and 2017, and according a member off my FB-group his inside Honda-contact, there must be +/- 8400 cars rolled off the production line in Swindon. With this very low figure a more than exclusive car! Therefore I decided to launch this website to unite the real FK2 owners on one platform. And I would like to give these owners the chance to present their unique car with their unique R-number here with pictures and accompanying information as modifications on the car etc. Enjoy your Honda Civic Type R FK2 fully and remember, always drive safe with this dreamcar!